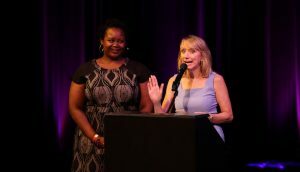 WEST BLOOMFIELD, Mich.–EncoreMichigan.com’s annual Wilde Awards program, which rewards the best productions, actors, artists, designers, writers and theater technicians, was held at The Berman Center for Performing Arts here, with two theaters tying for twelve nominations a piece–The Purple Rose Theatre in Chelsea and The Barn Theatre in Augusta–with Mason Street Warehouse in Saugatuck and Theatre Nova in Ann Arbor tying for three top awards, the most of any theater in the state. The award for Best Play went to Theatre Nova’s The Revolutionists, directed by David Wolber. The play, by Laura Gunderson, is about four women during the French Revolution who were all beheaded, but never met. Gunderson manages to weave their lives together for an excellent result. Melissa Beckwith won the top award for Best Supporting Actress in a Play. The award for Best Musical went to Encore Musical Theatre in Dexter for its production of Sweeney Todd, directed by Matthew Brennan. 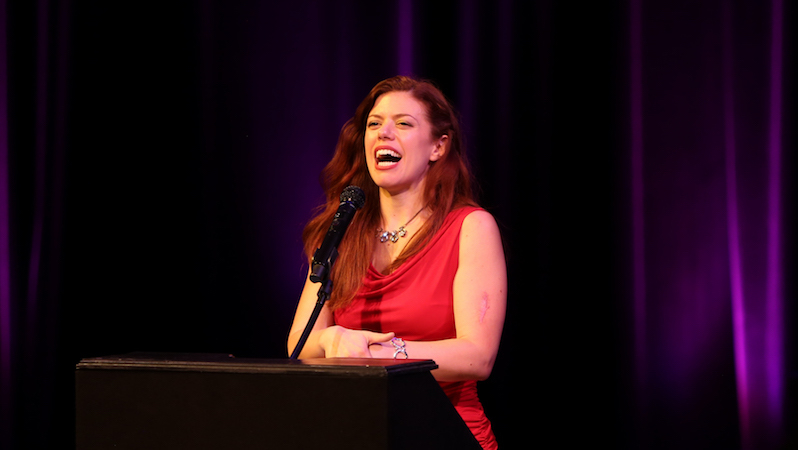 Sarah Stevens, who played Mrs. Lovett, won the award for Best Lead Actress in a Musical. Diane Hill and K Edmonds, cast members in The Revolutionists, accepting the award for Best Play. The Encore Musical Theatre took two awards and had seven nominations. Theatre Nova won three top awards and was nominated in six categories. The award for Best Actor in a Play went to Bailey Boudreau, the artistic director of Slipstream Theatre Initiative in Ferndale for his role playing Tennessee Williams in Tennessee Williams: Night of The Stars. The play, by Max Vinogradov, also won the top award Best Original Screenplay. Vinogradov, a student at the University of Michigan, won the Hopgood Prize for the play, which focuses on the multi-layered life of the legendary playwright and the many stars his work brought into fame. The award for Best Actress in a Play went to Krista Schafer Ewbank, the artistic director of Open Book Theatre in Trenton for her role Emilie: La Marquise Du Châtelet Defends Her Life Tonight–a play about a woman who rivaled Voltaire in her time for philosophical and scientific thinking. Matthew Brennan, who directed Sweeney Todd at The Encore Musical Theatre, accepting award for Best Musical. Michigan Opera Theatre nearly every year dominates and often sweep the opera categories, but this year, a relatively new company, Opera MODO, won the award for Best Opera for its La Cenerentola, a very creative and inventive take on the Cinderella story. Sponsors for the Wilde Awards are The Berman Center for Performing Arts; Pride Source Media, publisher of Between The Lines; The Kerr-Russell Law Firm; The Actors Equity Association; The Kalamazoo Arts Council; The Flint Repertory Theatre; and Falcon Paymasters. This year, EncoreMichigan renamed its Rising Star Award, sponsored by Kerr-Russell the Terry Heck Rising Star Award, named for the late Terry Heck, who was tragically killed in a motor-car accident earlier this year. Heck, winner of last year’s Best Actress in a Play Award, was a beloved theater professor at Eastern Michigan University in addition to having decades of top acting and directing credits. The winner of the award was Christian Perez, who performed an incredibly challenging role in What A Do Theatre’s production of Angels in America. What A Do Theatre is based in Springfield, Michigan. 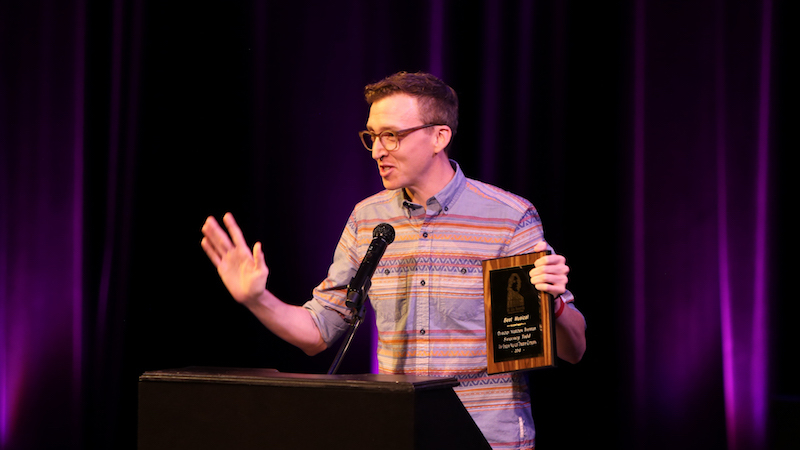 The annual Critic’s Award was given to David Magidson, a long-time director and faculty member at Maggie Allesee Department of Theatre and Dance at Wayne State University. Magidson teaches directing and playwriting. He has directed nearly eighty plays for fifteen different theatre companies, including Attic Theatre and Jewish Ensemble Theatre in the Detroit Area, and has written and produced far more. In addition, Magidson serves as co-director of WSU’s Center for Arts and Public Policy and director of the Jewish Community Center’s Lenore Marwil Jewish Film Festival. The Jim Posante Award for Community Pride was awarded to Steve DeBruyne and Matthew Tomich, partners in The Dio Dining and Entertainment Theatre in Pinckney, Michigan. “These two artists have brought professional award-winning theater to Pinckney and Livingston County, and the quality and breadth of the work there has really been something to see,” said Kiley. The Publisher’s Award was given to The Purple Rose Theatre for its production of Flint, written by Jeff Daniels. “This is a play that was a great service to our community,” said Kiley. “Combining first-rate writing, theatrical direction and production and terrific acting around this issue that still lives on in Flint deserved to be recognized as a whole, over and above the individual nominations received.” said Kiley. Bailey Boudreau wins Best Actor in a Play for portraying Tennessee Williams in “A Night of Stars with Tennessee Williams” at Slipstream Theatre Initiative. 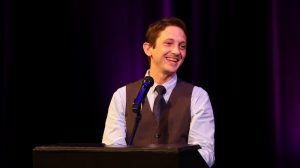 The 2018 Wilde Awards Show was emceed by Roy Sexton, who has performed with both community and professional theater across Southeast Michigan, and co-hosted by David Kiley who also serves as Executive Producer of the annual event. List of Awards, Nominees, Winners. Sonja Marquis: American Trailer Park Musical–The Dio– Dining and Entertainment.